With the flurry of parties and social occasions surrounding Christmas, it can be all too easy to move sluggishly through December in a haze of hangovers and heartburn. We’ve done a bit of scouting the web to see whether we could find events to warm our soul (as well as offering mulled wine) and as it turns out – there’s plenty! 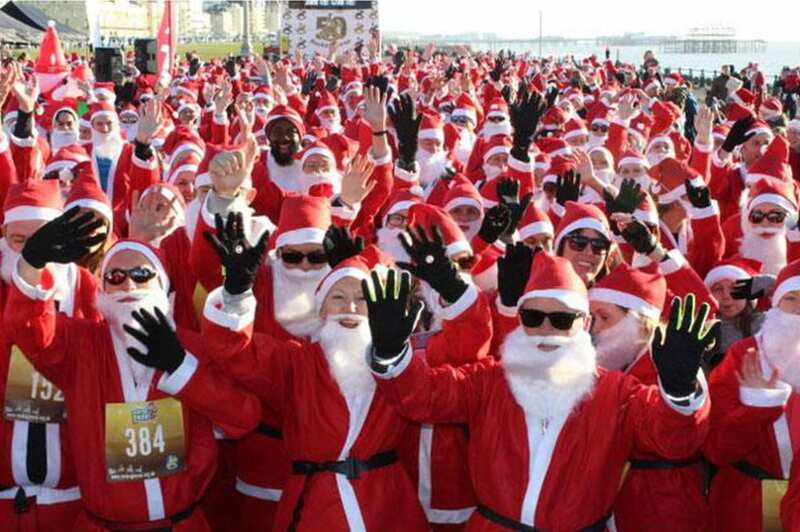 Head to Brighton seafront on the 8th December, and you’re bound to be in for a bit of a surprise as a gaggle of Santas stampede along the promenade! If you can’t beat them, why not join them in running 5k suited and booted to raise money for The Rockinghorse, one of Brighton’s well-loved children’s charities. If you’re searching for a gift that is truly meaningful, why not follow the artist’s houses trail across the city, where you’ll find incredible prints, paintings, jewellery and crafts – all made locally. Each piece comes with a story and the atmosphere is extremely festive with plenty of houses offering complimentary mince pies and hot drinks to guests. All the money goes back into the community and helps local artists to make a living from their craft so it’s well worth saving a few pennies to support them. Glow Wild is back and bigger than ever this year and if you’re quick – you should be able to nab one of the few tickets remaining. Set in the stunning scenery of Wakehurst Place, guests will follow a trail made up of handmade lanterns, crafted by local school children and volunteers. It’s a fantastic way to keep your family in touch with nature through the winter months – just remember to wrap up warm! One of Brighton’s favourite events is back and bigger than ever this year! A great way to buy contemporary handmade gifts and support local small businesses, you’ll find everything from screen printed bags to homemade skincare. The event has gone from strength to strength, outgrowing all previous venues and is now hosted by the Brighton Dome which adds to the festive atmosphere. The Dignity platform is a new way to skill swap and get jobs done in Brighton – with all money going to charity. Fancy some help popping up the Christmas lights or wrapping some presents? Pop up your request on the platform and wait for someone to offer their services! You’ll pay a small fee (which goes to charity) whilst also getting those pesky jobs done. The platform has recently teamed up with The Real Junk Food Project who work hard to reduce the amount of surplus food wastage in the city, and this meetup will focus on what the partnership means and how the two organisations will work together going forward – bound to be an interesting eve! St Catherine’s Hospice is a fantastic Sussex charity, supporting people and their loved ones to cope with death in an informed and supported way. This December, they are holding a special community Christmas service at the K2 Leisure Centre in Crawley to celebrate the lives of those who have passed away and the opportunity for loved ones to dedicate a star for them to be hung on the Christmas tree. It’s sure to be a moving and joyful celebration of life and a great way to raise money for a local cause. Find out more about our yearly charity commitment.